In recent months Google has released some information on a new remote sensing analysis platform that they are developing called Earth Engine. The platform will allow users to run remote sensing algorithms against petabytes of remote sensing data stored in the Google cloud. The initial announcements were made right before the International Climate Change Conference (COP15) held Copenhagen in 2009. 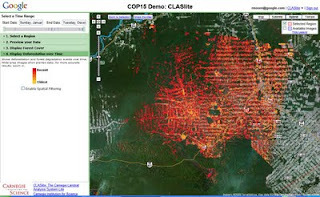 The initial demo application was monitoring deforestation in the Amazon rain forest. More recently, an interview with Rebecca Moore, Engineering Manager of Earth Engine, describes more of the project's background, goals, and the intended launch (later this year in advance of COP16). Despite the unknown details, it looks like this platform could be a valuable tool for remote sensing education, by enabling users to run and distribute remote sensing analyses to anyone with a web browser. AmericaView will be watching this project to see how it progresses. These articles are authored by members of AmericaView, a nationwide program that focuses on satellite remote sensing data and technologies in support of applied research, K-16 education, workforce development, and technology transfer. If you have comments or questions, please contact us. If you are affiliated with AmericaView and would like to contribute to the blog, read this post and follow the instructions.